These interactive maps combine information from the 1822 and 1834 city directories with historic maps of Washington, D.C., to create a spatial representation of the capital city's earliest residents and neighborhoods. This map attempts to reconstruct who lived where in as much of early Washington, D.C., as we can, including the residents of Georgetown and Alexandria. We have cross-referenced the names in the city directories with names found in the D.C. Circuit Court case files for petitions for freedom, plotting jurors, witnesses, lawyers, plaintiffs, defendants, and other participants in the freedom suits. We have cross-referenced the names with other important sources, including the approximately 1,000 signatories of the 1828 Memorial to abolish slavery in the District. In the first instance, this map attempts to locate all inhabitants of early Washington, D.C. And second, it allows scholars, teachers, students, researchers, and genealogists to query the database for individuals and their spatial relationships in the city. The data from the 1828 Memorial and 1834 directory will be included soon. 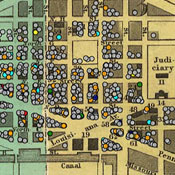 A Story Map exploring the 1822 city directory for Washington, D.C.
A Story Map in development. Historical Maps of Early Washington, D.C.